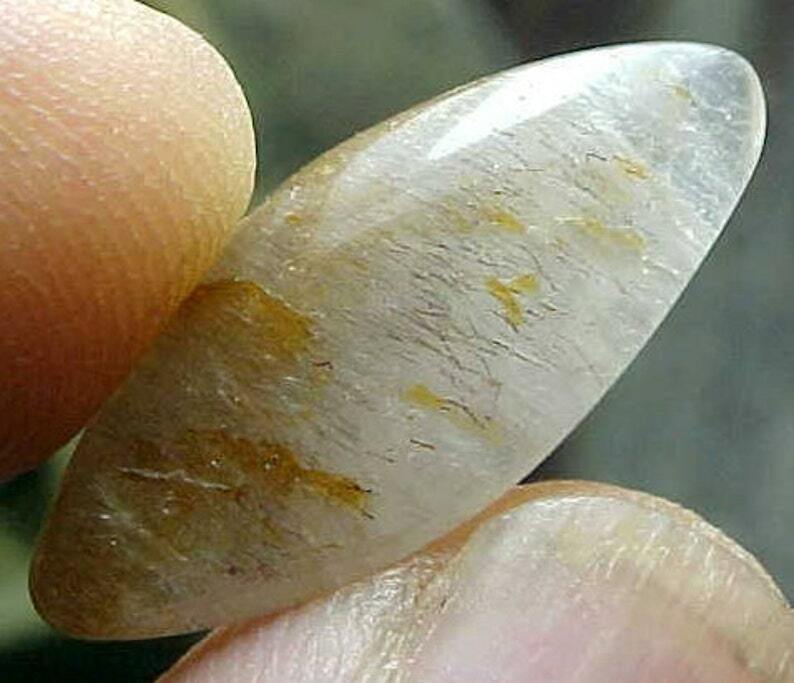 Check out this Agape Crystal (baguette or marquise shaped) pendant bead that measures 1 1/8x1/2x1/4" and has been hand-selected for its beautiful minerals, including golden spears of Cacoxenite, ruby-red filaments, splashes or buttons of Lepidocrocite, fine filaments of Rutile, bolder dark gray, mirror-like ribbons of Hematite or rarely, tiny nodules of black Goethite. We will let our photos tell the story. All of our Agape Crystal beads have been bathed in the flowing waters of a beautiful, crystal-pure, spring-fed creek in our beloved Ouachita National Forest, near Mount Ida, AR. You will receive the exact lot of beads pictured here, along with a purple keep-sake bag, a photo postcard of our Agape Crystals being bathed in our spring waters, and a signed certificate as our promise that you have purchased a genuine Agape Crystal. AGAPE CRYSTALS (which contain the energies of Amethyst, Smokey and Clear Quartz, Rutile, Lepidocrocite, Cacoxenite and Goethite) never need clearing or cleansing and come only from Espirito Santo, Brazil. The name "agape" comes from the Greek word meaning "an out-pouring of unconditional love" from above. After many years of working these crystals, we have also discovered some rare crystals that have exhibited 5 other minerals as well. Agape Crystals are associated with an out-pouring of the Divine Feminine energies such as unconditional love, compassion, forgiveness, and healing, to name a few. The "brotherhood" of minerals contained within these crystals is not unlike our brothers and sisters of our Native American Medicine Wheel, all sharing their energies and gifts with their human companions to help them on their paths to spiritual enlightenment and completion. They are wonderful companion crystals for "reviewing and releasing" old ways of thinking and acting which do not serve us on our paths to enlightenment. They can also help us to create a new path to allow the ways of "peace and harmony" to rule in our lives, and help us to re-focus and manifest what is needed. In addition, these Agape Crystals can aid us in awakening, stimulating, and developing our psychic abilities, including telepathy, clairvoyance, clairaudience, claircognizance and clairsentience. It should be noted here that even if some of these minerals are microscopic and not eye-visible within the stone, all of their properties are still within the crystal, as they are all indigenous to the area where these crystals are mined. Just like the minerals within Mother Earth that flow through the vine into the grape to give a fine wine its distinct flavor, so do these minerals combine to create this incredible crystal. Agape Crystal vibrates to the master number 11, the most intuitive of all numbers, representing illumination and deep insight, as well as spiritual harmony.